Complementary therapies used in conjunction with classical medicine to improve the treatment of difficult cases. Applied relatively recently in veterinary medicine, osteopathy is a form of ancient therapy. It was Dr. Andrew Taylor Still who gave a name to this manual medicine in 1874. The basic principle of osteopathy is that only a living being in perfect physiological balance can remain healthy and defend against external aggression. When mobility restrictions appear, the body tries to compensate for the imbalance and creates a disorder in the microcirculation and biomechanics of the body. The osteopath tries to diagnose these blockages and to make them disappear with the help of manipulations, so that the body returns to its original equilibrium. When to use osteopathic services? 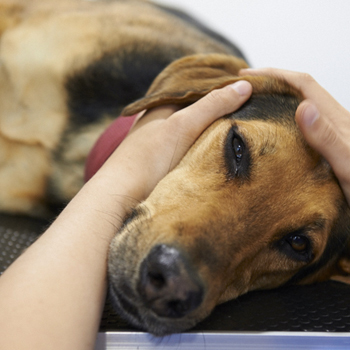 Osteopathy can be used preventively, even if the animal has no symptoms of disease. It can also be beneficial during apparent symptoms such as lameness of any kind, digestive disorders, chronic cough, neurological problem. On the other hand, conditions with surgical indications (fractures, herniated discs) or those with acute symptoms (bacterial, viral or fungal infections) must first be treated in classical medicine. Very sporty animals are good candidates for regular follow-up in osteopathy. 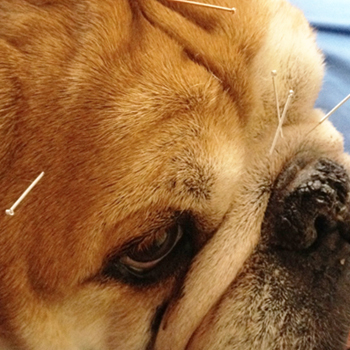 Acupuncture was first used on horses, and then practiced on humans and dogs. 5000 years old, this medicine is now used throughout the world as a main medicine or in addition to Western medicine. It is considered a holistic medicine, that is, it treats the animal as a whole rather than treating a particular symptom. It treats the imbalance of the body affecting its proper functioning, allowing it to "treat" itself. It is a preventive medicine, not only curative, that brings the body to balance to prevent all kinds of infections and all symptoms of disease. Acupuncture is therefore a good complement to traditional medicine to provide the animal with all the strength needed to regain or maintain health and a better quality of life. Acupuncture works based on a circuit of meridians that act similarly to blood and lymphatic circuits. The energy circulating through the meridians can be modified by cutaneous "openings" the "points". When a meridian is unbalanced, the stimulation of a specific point by the needle puncture, the use of a laser pencil, the injection of an anesthetic or stimulant product, can restore the balance. Acupuncture is used to treat many metabolic, nerve or locomotor conditions. It stimulates the nervous, blood and lymphatic systems as well as the immune system.